An oral potentially malignant disorder (OPMD) is a common term suggested to replace oral pre-cancer, including both oral precancerous lesions and oral precancerous conditions. All oral lesions that carry a risk of malignant transformation are included under this term. The OPMDs included in this review are leukoplakia, oral lichen planus, and oral submucous fibrosis. A systematic literature search of MEDLINE and PUBMED for articles published till 15 July 2014, with language restricted to English, was done using the terms: 'Oral potentially malignant disorders', 'oral premalignant lesions', 'oral premalignant conditions', 'oral precancerous lesions', 'oral precancerous conditions', 'leukoplakia', 'erythroplakia', 'oral lichen planus', 'erosive lichen planus', 'oral submucous fibrosis', 'smoker's palate', 'stomatitis nicotina palati', 'stomatitis nicotina', 'actinic chelitis', 'plummer vinson syndrome', 'oral chronic non healing ulcer', 'cytokeratin 18', 'cytokeratin 19', 'keratin 18,' and 'keratin 19'. All abstracts were reviewed independently and if an article was considered relevant, full articles were obtained and evaluated. Types of studies: In-vivo studies. 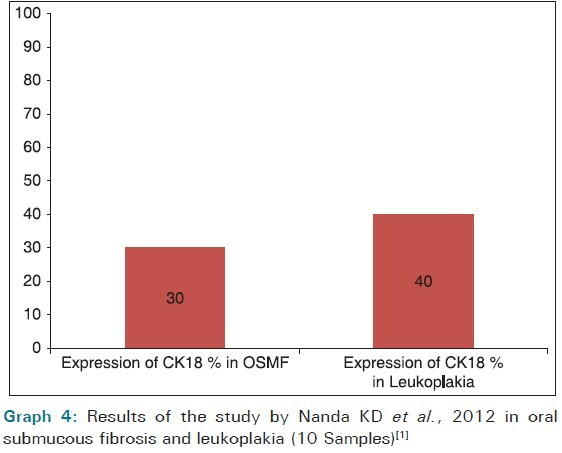 Experimental studies, where expression of CK 18 and/or 19 assessed in one or more OPMDs was confirmed histopathologically. Types of studies: In-vitro studies. Case reports, case series, review articles. Articles in languages other than English. Studies in which another parameter or tumor marker, apart from CK, was also assessed. A total of four articles were identified for inclusion in this review. The search of PubMed and MeSH databases provided a total of 19 articles and a hand search gave one article through back references, out of which four met the inclusion criteria and 16 were excluded. The full texts of the included four articles were examined in detail. [Table 1] shows the level of evidence according to the Canadian task force's hierarchy of evidence. The characteristic of the studies included are summarized in [Table 2]. [Table 3] and [Table 4], and [Graph 1], [Additional file 1] [Graph 2], [Additional file 2] [Graph 3], [Additional file 3] [Graph 4] [Additional file 4]show the description and interpretation of the results of the studies evaluating the expression of CK 18 and 19 in OPMDs. Thus, studies assessing the expression of CK 18 and/or 19 in one or more oral potentially malignant disorders were included in this review. Studies that assessed any other parameter along with CK were excluded. Abstracts and letters were not considered, as their data are often insufficient for analysis in a systematic review. The primary outcome measure in these studies was the expression of CK. 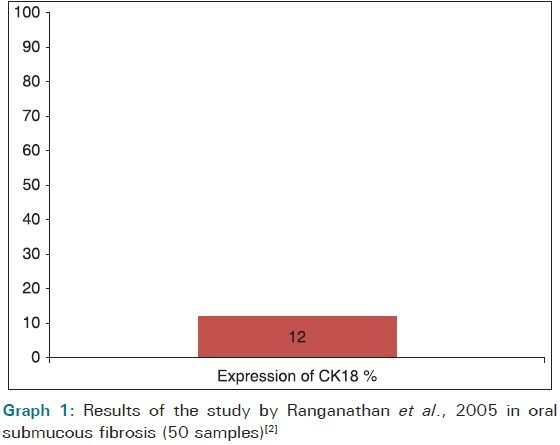 In one study, by Ranganathan et al.,  in 2005, CK 18 expression was 12% in the examined 50 samples of oral submucous fibrosis, which inferred that the aberrant expression of CK18 in these tissues could be indicative of the initiation of abnormal cell differentiation. In another study by Kittipong Dhanuthai et al. in 2007, CK 18 expression was 16.7% in the examined 30 samples of lichen planus, suggesting an increased expression in lichen planus. In the third study by Nanda et al,  in 2012, CK expression was 40% in 10 samples of leukoplakia and 30% in 10 samples of oral submucous fibrosis [Table 3]. 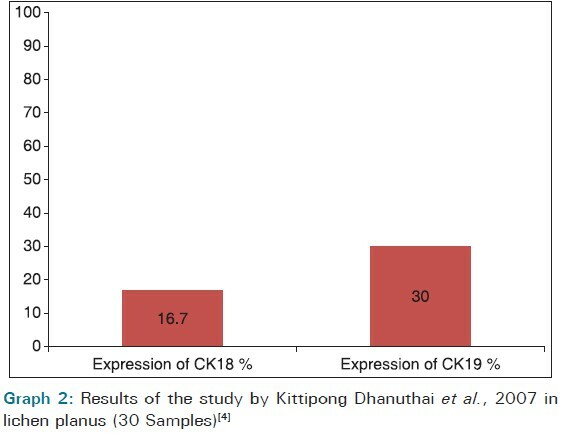 Cytokeratin 19 expression was found in 30% of the 30 samples examined in lichen planus in the first study by Kittipong Dhanuthai et al.,  in 2007, while 19% of the samples showed CK 19 expression in the 21 samples of lichen planus examined by Claudio MC Jacques et al.,  in 2009 [Table 4]. 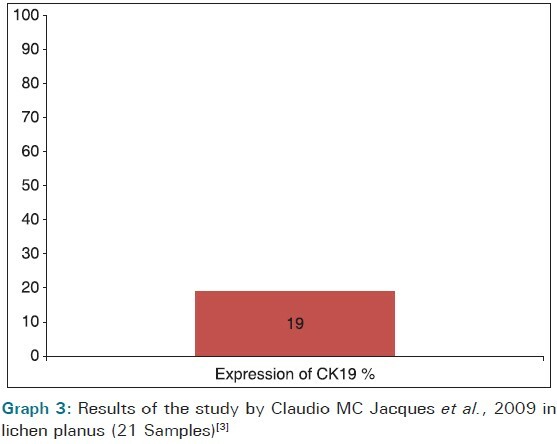 The available literature shows that CK 18 and 19 are expressed in oral potentially malignant disorders (leukoplakia, lichen planus, and oral submucous fibrosis) although the level of expression of CK 18 and 19 varies among different OPMDs and among different studies. The review emphasizes on the potential use of CK 18 and 19 as an aid to predict the possible malignant transformation of OPMD, which would help initiate early treatment with a better prognosis. Nanda KD, Ranganathan K, Devi U, Joshua E. Increased expression of CK8 and CK18 in leukoplakia, oral submucous fibrosis, and oral squamous cell carcinoma: An immunohistochemistry study. Oral Surg Oral Med Oral Pathol Oral Radiol 2012;113:245-53. Ranganathan K, Kavitha R, Sawant SS, Vaidya MM. Cytokeratin expression in oral submucous fibrosis - An immunohistochemical study. J Oral Pathol Med 2006;35:25-32. Jacques CM, Pereira AL, Maia V, Cuzzi T, Ramos-e-Silva M. Expression of cytokeratins 10, 13, 14 and 19 in oral lichen planus. J Oral Sci 2009;51:355-65. Dhanuthai K, Chaiyarit P, Chowsrikul W, Wongsana P, Rojanawatsirivej S. Cytokeratin 18 and 19 expression in normal mucosa, lichen planus and squamous cell carcinoma. Acta Stomatol Croat 2007;41:23-30. Syrjänen S, Lodi G, von Bültzingslöwen I, Aliko A, Arduino P, Campisi G, et al. Human papillomaviruses in oral carcinoma and oral potentially malignant disorders: A systematic review. Oral Dis 2011;17(Suppl 1):58-72. Kerr AR, Warnakulasuriya S, Mighell AJ, Dietrich T, Nasser M, Rimal J, et al. A systematic review of medical interventions for oral submucous fibrosis and future research opportunities. Oral Dis 2011;17(Suppl 1):42-57. Barak V, Goike H, Panaretakis KW, Einarsson R. Clinical utility of cytokeratins as tumor markers. Clin Biochem 2004;37:529-40. Heyden A, Huitfeldt HS, Koppang HS, Thrane PS, Bryne M, Brandtzaeg P. Cytokeratins as epithelial differentiation markers in premalignant and malignant oral lesions. J Oral Pathol Med 1992;21:7-11. Vaidya MM, Sawant SS, Borges AM, Ogale SB, Bhisey AN. Cytokeratin expression in precancerous lesions of the human oral cavity. Oral Oncol 1998;34:261-4. Schulz J, Ermich T, Kasper M, Raabe G, Schumann D. Cytokeratin pattern of clinically intact and pathologically changed oral mucosa. Int J Oral Maxillofac Surg 1992;21:35-9. Mattila R, Alanen K, Syrjänen S. Immunohistochemical study on topoisomerase II alpha, Ki-67 and cytokeratin-19 in oral lichen planus lesions. Arch Dermatol Res 2007;298:381-8. Coltrera MD, Zarbo RJ, Sakr WA, Gown AM. Markers for dysplasia of the upper aerodigestive tract. Suprabasal expression of PCNA, p53, and CK19 in alcohol-fixed, embedded tissue. Am J Pathol 1992;141:817-25. Ram Prassad VV, Nirmala NR, Kotian MS. Immunohistochemical evaluation of expression of cytokeratin 19 in different histological grades of leukoplakia and oral squamous cell carcinoma. Indian J Dent Res 2005;16:6-11. Boisnic S, Ouhayoun JP, Branchet MC, Frances C, Béranger JY, Le Charpentier Y, et al. Alterations of cytokeratin expression in oral lichen planus. Oral Surg Oral Med Oral Pathol Oral Radiol Endod 1995;79:207-15. Fillies T, Jogschies M, Kleinheinz J, Brandt B, Joos U, Buerger H. Cytokeratin alteration in oral leukoplakia and oral squamous cell carcinoma. Oncol Rep 2007;18:639-43.